What makes a good balloon pump? Balloons have the magic ability to delight us and are essential for any birthday party. Though balloons are fun and exciting, blowing them up isn't always fun as they require a good set of lungs or a balloon pump. One should always use a balloon pump to inflate a balloon. Keep balloons away from eyes and face as the bursting of balloon may cause injury and do not try to inflate a balloon by mouth. What should you look for while choosing a good quality balloon pump? 1) A good quality pump must be strong , durable, but at the same time light weight and easy to carry. 2) Must fit all types of balloons like modelling balloons, round balloons of different dia meters. 4) and also be maintenance-free. This balloon pump is made in Sweden, exclusively for Gemar balloons, Italy for their sole official distributor in India - 'bubbly balloons' and is now offered for sale on amazon . It is more efficient than many balloon pumps available in the market as it has dual action. This balloon pump inflates faster and with less effort because of a unique double action design where they pump air on both the push and pull strokes, which creates an even air flow. That is, the pump Inflates the balloon when you push the pump as well as when you pull the pump- bothways (twin- action), for easy, faster and effortless balloon inflation. The out stroke and in stroke give out air and this balloon pump reduces the back flow of air from the balloon to the pump. These balloon pumps are precision crafted from rugged durable plastic and are compact and light weight, and the nozzle is formed with a snoopy top on the handle to fit most types of balloons of different dia meters and modelling or twisting balloons without any extra adapter. The pump requires no real maintenance. To get an old pump to function like new, you can, if necessary, add a little oil that you use for preparing food. We have heard of a balloon artist who used the same pump for over 10 years! This balloon pump is the same that most balloon decorators and balloon twisters use the world over. 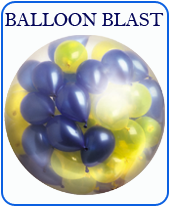 It is highly recommended for balloon decorators and also for balloon twisters, as it is durable, portable, easy to use and affordable. Have you gotten yours?